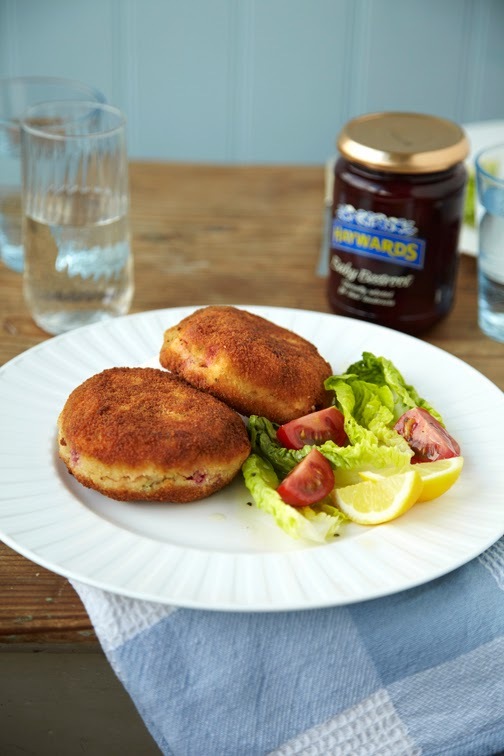 Haywards have come up with this lovely recipe for Salmon and Beetroot Fishcakes. Everyone loves Haywards pickles and although I hate to mention the 'Christmas' word so soon, on Boxing Day, leftover turkey with mashed potatoes just has to happen and without Piccalilli and Red Cabbage it's just not the same. You can also make a simple salad dressing by whisking together 1 tbsp lemon juice and zest and 2 tbsp olive oil, and season with salt and pepper. In a large bowl, mash the tinned potatoes with a potato masher. Add the pink salmon, parsley, lemon juice and zest and 1 of the eggs, and mix thoroughly. Season with pepper, then lightly mix in the chopped beetroot. Set out a bowl with the remaining egg (beaten) in it and a bowl with the breadcrumbs. Dust your hands with flour and shape the mixture into eight fishcake shapes, placing them on a plate, as you go. Coat the fishcakes with flour on the plate, then, one at a time, dip them in the beaten egg, coating thoroughly, and then coat them in the breadcrumbs. Place them back on the plate. Chill for at least 10 mins. Heat the oil in a frying pan and, when the oil is sizzling, add the fishcakes, cooking for 3-4 mins, then turn them over and cook for a further 3-4 mins. You may have to do this in batches, according to the size of your pan. Drain on kitchen paper then transfer to plates and serve with salad and lemon wedges. Traditional Picked Onions are my favourite. I love the fishcake recipe, I've not thought of cooking with pickled beetroot rather than fresh. Has to be strong onions! I love piccalilli - lovely on a sandwich with some Cheshire cheese. I've never tried these before but the Beetroot sounds nice!! Piccalilli - have had it every single Christmas since I was a little kid. Have it with boiling bacon and mash potato. Sweet onions, lovely in salads. I love sweet onions ! I love sweet pickled onions! My favourite would have to be the Baby Beetroot - I'll often have these with salads, with savoury rice dishes, in sandwiches and rolls with ham & humous, and have been known to just snack on them! The small sweet onions are also quite good. i like all hayward products,especially crunchy pickled onions. The Traditional Pickled Onions. I can just eat these out of the jar. Piccalilli has always been my favourite. I even have at times sat eating it straight from the jar. Other brands are okay but Haywards is by far the best. Never had a Haywards as i normaly a shops brand. Got to be strong onions!! !